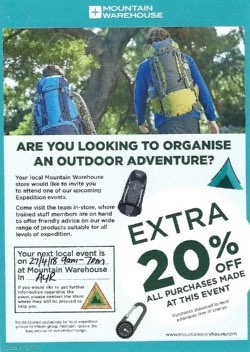 As of April 2018 we have a special arrangement for MOFs members to claim 10% discount on all Mountain Warehouse products (Terms and Conditions apply). Just show your MOFs membership whenever you visit the branch in Ayr. Maybole Over 50’s have teamed up with award-winning Fred. 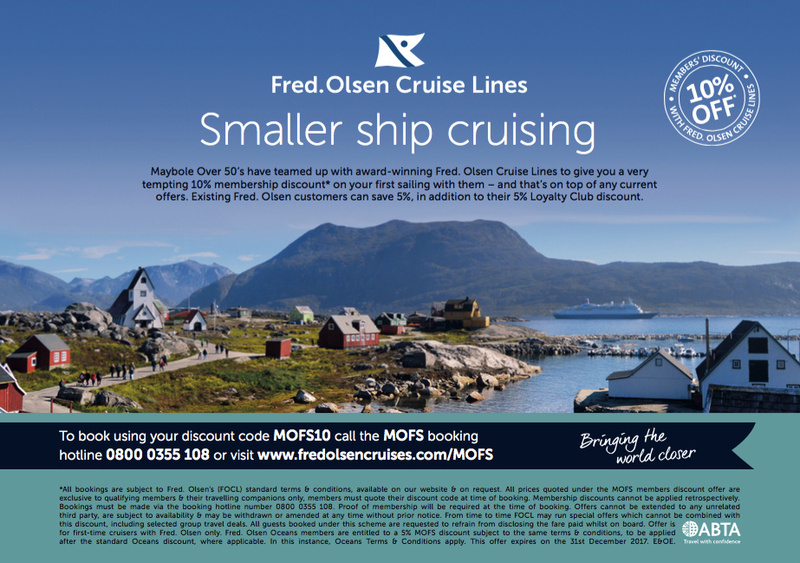 Olsen Cruise Lines to give you a very tempting 10% membership discount* on your first sailing with them – and that’s on top of any current offers advertised. If you have previously cruised with Fred. Olsen members can save 5% on top of your existing Fred. Olsen 5% Oceans Loyalty Club discount. At Fred. Olsen, we understand what makes a cruise holiday so special. It’s sailing to incredible destinations far and wide in pure comfort with like-minded travellers, enjoying fabulous food as you glide across the ocean, discovering out-of-this-world experiences and forging friendships that will last a lifetime. This is why we carefully craft each and every one of our cruises – from weekend breaks in Dublin to 108-night voyages around the globe – to ensure your time on board with us is simply unforgettable. With 10 departure ports conveniently located across the UK and more than 200 ports of call to choose from, you can travel the whole world with Fred. Olsen. Discover the spectacular Norwegian Fjords, cruise the beautiful rivers and waterways of Europe or relax on the white sand beaches of the Caribbean. Wherever you sail, you’ll be enjoying it all on our smaller, more friendly ships. Contact our Secretary, Anne Walker (Tel: 07846 180753), in order to get your special discount code (available only to members of Maybole Over 50's). Once you have your discount code you can book your holiday by calling Fred. 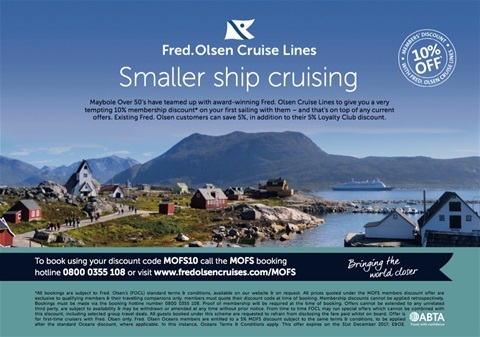 Olsen Cruise Lines on 0800 0355 108 or online at http://www.fredolsencruises.com/mofs (You may also be required to quote your MOF's membership number so please have your membership card to hand if you phone the booking line). *All bookings are subject to Fred. Olsen’s (FOCL) standard terms & conditions, available on our website & on request. All prices quoted under the MOFS members discount offer are exclusive to qualifying members & their travelling companions only, members must quote their discount code at time of booking. Membership discounts cannot be applied retrospectively. Bookings must be made via the booking hotline number 0800 0355 108. Proof of membership will be required at the time of booking. Offers cannot be extended to any unrelated third party, are subject to availability & may be withdrawn or amended at any time without prior notice. From time to time FOCL may run special offers which cannot be combined with this discount, including selected group travel deals. All guests booked under this scheme are requested to refrain from disclosing the fare paid whilst on board. Offer is for first-time cruisers with Fred. Olsen only. Fred. Olsen Oceans members are entitled to a 5% MOFS discount subject to the same terms & conditions, to be applied after the standard Oceans discount, where applicable. In this instance, Oceans Terms & Conditions apply. E&OE. Maybole Over 50's: Please note that Maybole Over 50's will not be held responsible for any issues or disputes that arise relating to any cruise booked through this offer.